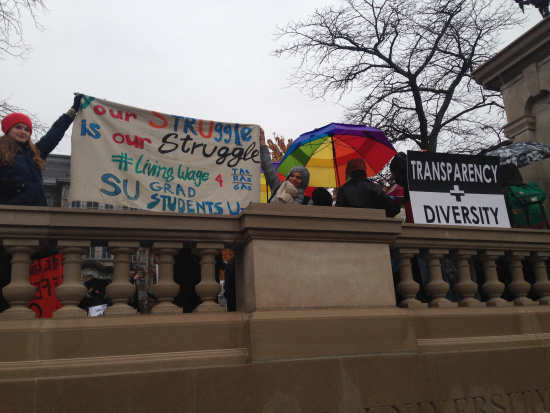 Cooperative Federal expresses solidarity with THE General Body and their movement for structural changes to the administration of Syracuse University related to transparency, diversity, and safety. TRANSPARENCY: As a cooperative entity we uphold transparency in our operations through governance by a Board elected democratically by our shareholding members on the basis of one member, one vote. Institutions should exist to serve people, not the other way around. Our investment in Syracuse to date is over $110 million. All of our members’ money is put to work in and for the local community. 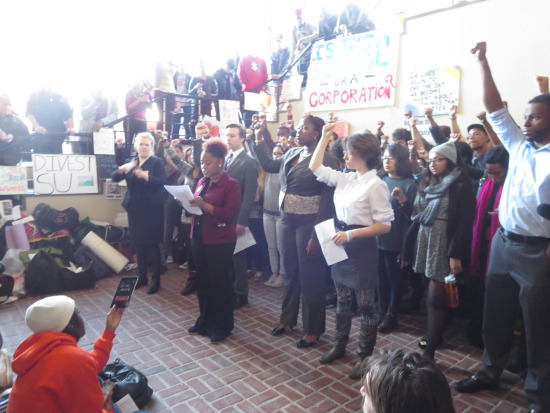 We oppose the corporatization of education and exclusion of the students (stakeholders, if not technically shareholders) and the campus community from access to budgetary information, and the blocking of the inclusion of wording that supports diversity, citizenship, accessibility, democracy, and community engagement in any mission statement. Budgetary decisions should also respect and respond to requests for an increase in library and graduate student employee funding, as well as divestment from fossil fuels. DIVERSITY: As a financing entity, Cooperative Federal takes great pride in re-investing all of our member’s savings into the community of those we represent – highlighting a culture of mutual aid and service across the diverse membership we are dedicated to cultivating. More than any other financial institution in Syracuse, we provide services to those underserved by conventional for-profit banks – including a growing number of recent immigrants and refugees, from every corner of the globe. Most of our members live on low incomes and a majority of our members are people of color. Our own beginnings are in line with many campus movements of the last thirty years. Cooperative Federal was organized by a group of local activists seeking a viable and radical alternative to global corporate banks, specifically at that time, divestment from the racist Apartheid regime in South Africa. We continue to uphold a mission of fair services for people of color, single women, the LGBT community, activists and other low-income or nontraditional workers; through special loan terms, Servicios Bilingues, and a “commitment to serve all members fully”. SAFETY: As an entity of the people, we fully respect and encourage the right to a peaceable, public redress of grievances as enshrined in our Constitution and traditions. This includes full inclusion of provision for mental health and sexual assault services, accessibility for those with disabilities, and preventative measures for those identifying as marginalized, as put forth within THE General Body’s list of needs. Each member of a community should not only have the same rights as others whom share the same equity of being a functioning and contributing person within an institution, but also the same expectations towards a system and community of services that evolves with THE General Body and the needs they identify. Each member, regardless of their wealth or ability, has an equal vote and an equal share in our success at Cooperative Federal, a model which we believe is key to a system that works for people, not for profit. Private educational organizations can take steps within their investments, campus services, and charter to ensure that they include such values as well. Based on this belief and our record of engagement and service, Cooperative Federal proudly expresses our support for THE General Body at Syracuse University, and student movements everywhere against discrimination, unequal privilege, and lack of student community access to administrative redress. We honor the students fighting to demonstrate another way is possible within our current society, and stand with you throughout this work in progress. As you enter the next stage of your protest after spending 18 consecutive days in Crouse-Hinds Hall, we salute your resolve, and we, at Colgate University, stand in solidarity with you and your movement for change on your campus. We wholeheartedly support your ongoing battle and we are outraged at the complete lack of respect and dignity the Syracuse University administration has shown THE General Body. We are disheartened by the University’s lack of response to your reasonable and necessary demands. You are fighting for the safety, health, inclusion, and security of all Syracuse students and your fight has not gone unnoticed. Your struggle is our struggle. Our admiration for your dedication runs deep. We too are strongly against the changes made in the Fast Forward platform, and agree with you that Syracuse University needs to re-wind and focus on creating an open environment for students of all backgrounds. We support your fight for campus accessibility, divestment from fossil fuels, a positive and safe sexual climate, inclusivity and transparency, attention to mental health services, the celebration of Indigenous Peoples Day and an overall environment that benefits students of all backgrounds. 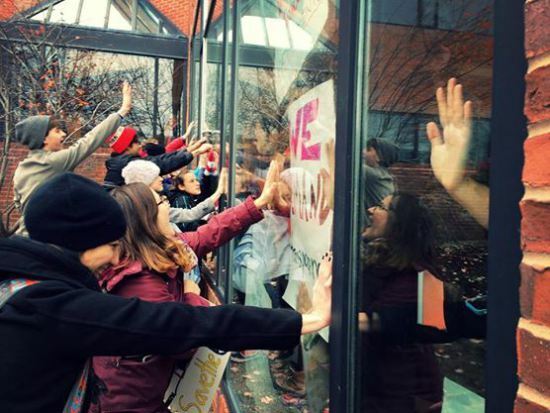 We stand firmly against the actions of the Syracuse University administration, which has locked students in over the weekend, put in barriers to block student visibility, stationed security guards at the space, and taken other steps to block justice and the right to freedom of assembly. At our own sit-in, we first-hand experienced the importance of this right and are appalled at what has been happening during THE General Body’s movement. 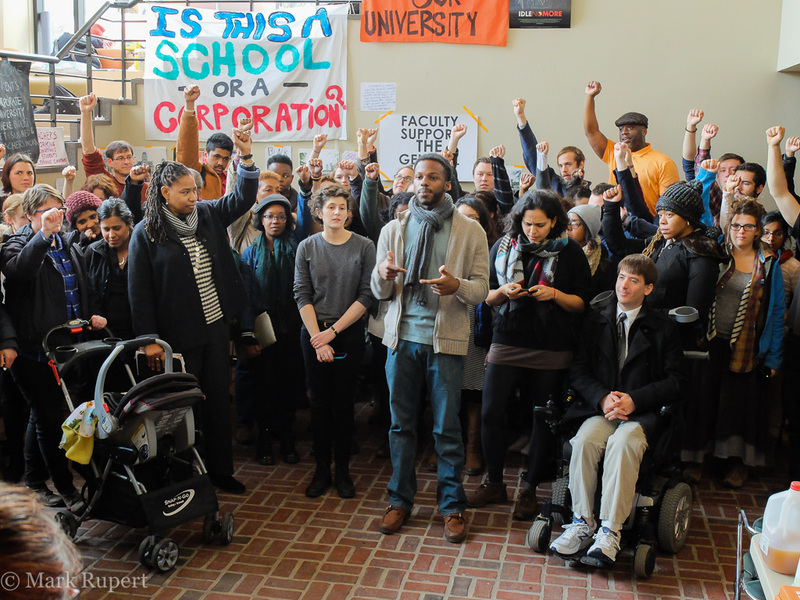 As we are still in the process of an ongoing and long struggle to transform the climate of Colgate University, it should be noted that our struggles are part of a general struggle to transform education from its corporate model to a democratic and equal one. Individuals must work together to combat systemic and cultural oppression and marginalization. We are inspired by your efforts and send you solidarity and support as your movement continues. Today, we write to you in solidarity. 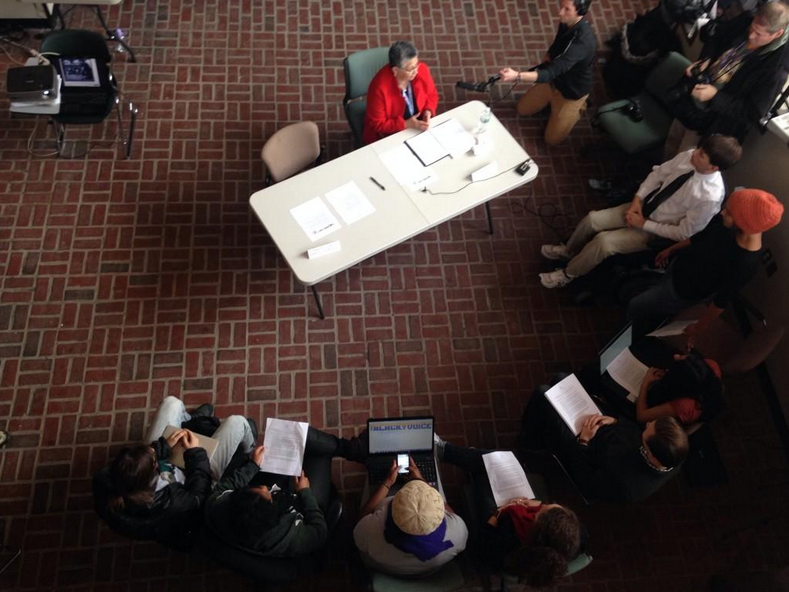 As we left the Syracuse University administrative offices and our 18-day sit-in ended, yours began. We echo your cries for justice — they ring in our ears. Your struggle did not begin today; it is laden with histories of silence and violence. Ours did not end today; as we move into our next phase of activism, we are cognizant of the mountain before us. There will always be more work to do. Your bodies are your weapons and your shields. As you use them to fight for your education, please remember to love them. They will not be loved, respected, or regarded by those who try to speak over your voices. You must be louder than them. You may walk away with new scars, but do not forget that your bodies are already the sites of violence and oppression. Audre Lorde once said, “Caring for myself is not self-indulgence, it is self-preservation, and that is an act of political warfare. Be strong, and know that we sit with you. The Cold Case Justice Initiative and the Democratizing Project at Syracuse University are in full support of the actions taken by the student-led organization called THE General Body (TGB). 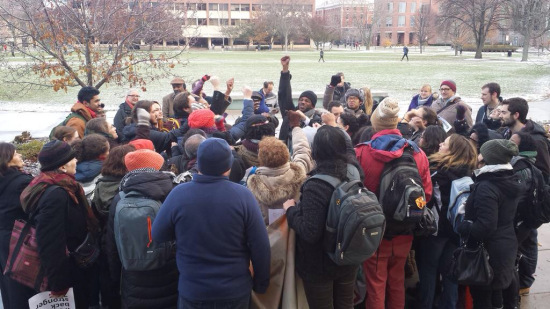 We have followed and participated in the student sit-ins over the past two- weeks and the negotiations that have occurred, and urge you to continue to work with TGB in meeting their needs. We also write to register our strong objections to the administration’s handling of the legitimate concerns the students have raised and object to the intensifying acts of intimidation, harassment, and threats that have been waged against them. Members of THE General Body are not our enemies; they are our integral members of our community and they deserve our respect and support. We thus condemn their treatment in the strongest possible terms. The students who have organized the sit-ins and articulated university needs are the best Syracuse University has to offer. Their level of commitment and enthusiasm in improving the educational landscape and environment of Syracuse University is evident. Although they have been harassed, intimidated, and targeted by DPS, they have remained steadfast. These students must not be penalized for their grievances and actions, but rather, the university must actively work with them in solving the deep-seated issues which they have brought to the fore and that have long affected our University. The events that have transpired this semester present us with many challenges but also offer us educational opportunities and avenues for change. Considering the political and social climate in many colleges and universities across the country, the needs expressed by our students are not unreasonable. In fact, students are only seeking what a world- class University should already provide: a conducive learning environment that is racially and ethnically diverse, free of discriminatory practices, cognizant of students’ needs, considerate of the changing student demographics, and supportive of student health and well-being overall. The students have called for transparency and meaningful participation in the decision- making at the University. 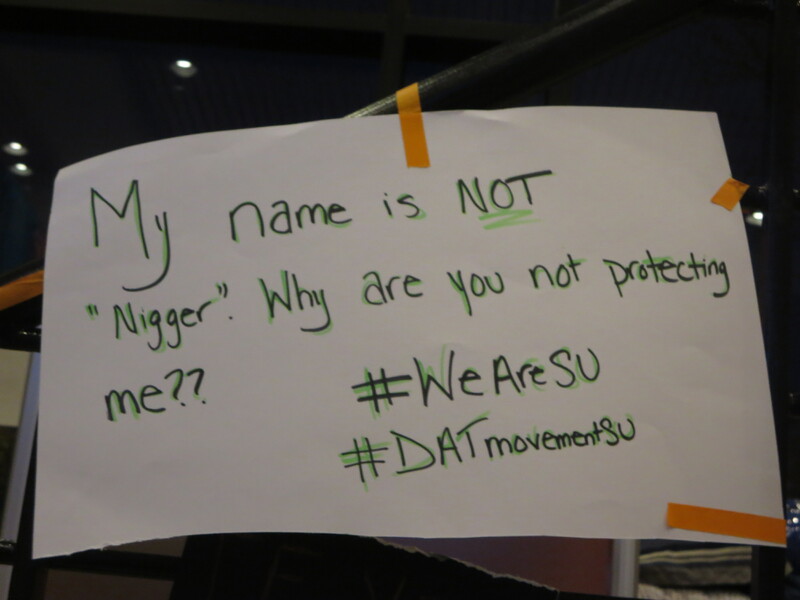 These demands concern all constituencies at Syracuse University and reverberate into the surrounding community. We call on you to return to the negotiating table with the students. There can be no final word on these matters until there is consensus by the SU community on the issues the students have raised and which impact all of us: students, faculty, and staff who call Syracuse University our home. While the sit-in might seem a distraction to the daily operations of the University, let us remind you that some of the best changes in American higher education have been the direct result of student discontent and organizing. We thus urge you to reassure us, as well as THE General Body, that you will continue to meet with them and not penalize, threaten, or punish them for their important contributions to our university community. TGB is the conscience of this university. As members of Syracuse University, we also speak in support of the students’ integral efforts. Together with TGB, we therefore demand a university that is transparent, accountable, and most of all, respectful of every member’s basic civil rights and civil liberties. I write this to express my sincere concern for the fate of Syracuse University, and to offer a humble suggestion for its future. My name is John Cardone, recent Public Artist in Residence with the Near West Side Initiative, and adjunct faculty in the University Honors Program. I am also a recent alumnus of SU with a degree in Sculpture and a minor in Creative Writing. I was an Imagining America Engagement Fellow, a VPA Scholar, member of the Honors Program, and two time recipient of the Chancellor’s award for public and community service. During my time at SU, I founded an ESL tutoring Program at Nottingham HS, assisted Prof. Sarah McCoubrey in starting after-school programs at the Blodgett School, and Coordinated a volunteer tutoring program at the Center for New Americans. I was also one of the key students involved in the development and maintenance of 601 Tully with Prof. Marion Wilson, a pursuit which brought me endless joy and invaluable experience. Suffice it to say that SU has served me extremely well in the past six years, and I in turn have done my best to give my service the university and to the city itself. And it precisely because of this exchange of service, this engagement of scholarship, that I consider my time in Syracuse to be the most valuable learning experience of my life.